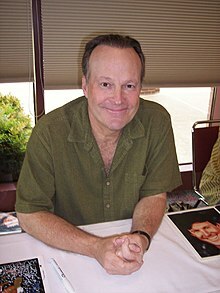 William Dwight Schultz (born November 24, 1947) is an American actor and voice artist. He is known for his roles as Captain "Howling Mad" Murdock on the 1980s action series The A-Team, and as Reginald Barclay in Star Trek: The Next Generation, Star Trek: Voyager and the film Star Trek: First Contact. He is also known in animation as the mad scientist Dr. Animo in the Ben 10 series, Chef Mung Daal in the children's animated series Chowder, and Eddie the Squirrel in CatDog. Schultz was born in Baltimore, Maryland, of German descent, and is a Roman Catholic. He attended Calvert Hall College High School and Towson University. Schultz's breakthrough role was the character of Captain "Howling Mad" Murdock on The A-Team. He subsequently appeared in several films, including The Fan (1981), and starred in Fat Man and Little Boy (1989) as J. Robert Oppenheimer. In the early 1990s, he had a recurring role as Lieutenant Reginald Barclay in Star Trek: The Next Generation, and reprised the role in Star Trek: Voyager and the film Star Trek: First Contact. Schultz also had a role in the Babylon 5 episode 'The Long Dark' (Season 2 Episode 5) as a former soldier still suffering the effects of war. Schultz played a dramatic change-of-pace role in the 1992 television film Child of Rage, starring opposite Mel Harris as a compassionate couple who adopt a troubled girl who has been sexually abused. Shultz hosted a conservative talk radio podcast called Howling Mad Radio, which ended in March 2009. He has also guest-hosted on numerous occasions for Michael Savage on The Savage Nation, Jerry Doyle on The Jerry Doyle Show, and Rusty Humphries on The Rusty Humphries Show. Schultz married actress Wendy Fulton in 1983. They have one daughter, Ava (born 1987), who serves in the Marines. Schultz is a conservative and in 2012 began regular appearances on The Glazov Gang, an Internet political talk show hosted by Jamie Glazov, managing editor of FrontPage Magazine. He also posts political commentaries and podcasts on his official fansite. 1981 Hill Street Blues Carmichael Episode: "Life, Death, Eternity"
1981 CHiPS Lyle Pickett Episode: "The Hawk and the Hunter"
1981 Standing Room Only Bassick Episode: "Sherlock Holmes"
1981 Nurse Dr. Kevin Michaels Episode: "Going Home"
1990–94 Star Trek: The Next Generation Lieutenant Reginald Barclay Episodes: "Hollow Pursuits", "The Nth Degree", "Realm of Fear", "Ship in a Bottle", "Genesis"
1994 Babylon 5 Amis Episode: "The Long Dark"
1994 Weird Science Hank Episode: "Circuit Courtship"
1995–2001 Star Trek: Voyager Lieutenant Reginald Barclay Episodes: "Projections", "Pathfinder", "Inside Man", "Life Line", "Author, Author", and "Endgame"
1995 The Outer Limits Leviticus Mitchell Episode: "If These Walls Could Talk"
1995 Flipper Wayne Cole Episode: "The Green Freak"
1995 Deadly Games Nathan Abrams Episode: "Motivational Speaker"
1995 Diagnosis: Murder Dr. Henry Wexler Episode: "Naked Babes"
1996 Nowhere Man Harrison Barton Episode: "Hidden Agenda"
1996 Touched by an Angel Dr. Adam Litowski Episode: "A Joyful Noise"
1997 Diagnosis: Murder Dr. Gavin Reed Episode: "Delusions of Murder"
1998 Stargate SG-1 The Keeper Episode: "The Gamekeeper"
1999 Walker, Texas Ranger Lloyd Allen Episode: "Safe Haven"
1997 Lois & Clark: The New Adventures of Superman Garret Grady Episode: "AKA Superman"
1999 Todd McFarlane's Spawn Doctor, NSC Operative Episode: "Seed of the Hellspawn"
1999–2000 Family Guy Clerk, Randall Fargus Episodes: "Holy Crap" and "Running Mates"
2003 The Cramp Twins Bouncy Bob Episode: "Walk Like a Man/Bouncy Bob"
2003 Rugrats Gracko Episode: "Diapies and Dragons/Baby Power"
2006 Avatar: The Last Airbender Trainer Episode: "Appa's Lost Days"
2006 Catscratch Carmendor Nuget Episode: "Blikmail/Love Jackal"
2008 Ben 10: Alien Force Dr. Animo Episode: "Voided"
2011 Scooby-Doo! Mystery Incorporated Older Danny Darrow Episode: "Escape from Mystery Manor"
2015 Teen Titans Go! TV Episode: "Oil Drums"
2015 Kirby Buckets Shredlock Episode: "Failure to Launch"
2018 The Powerpuff Girls Lester van Luster Episode: "Small World"
2019 Young Justice: Outsiders The Mad Hatter Episode: "Triptych"
^ Margulies, Lee (July 20, 1985). "Dwight Schultz: Typecast As Versatile". The Los Angeles Times. Retrieved December 31, 2010. ^ "Sound file" (MP3). Dwightschultzfansite.nl. Retrieved February 14, 2016. ^ a b "Dwight Updates Archive". Dwightschultzfansite.nl. Retrieved August 12, 2011. ^ "The Official Dwight Schultz fansite". Dwightschultzfansite.nl. Retrieved February 14, 2016. ^ "The Glazov Gang". YouTube. Retrieved February 14, 2016. ^ Chalk, Andy (February 17, 2016). "Master of Orion trailer reveals a cast of sci-fi stars". PC Gamer. Retrieved February 19, 2016. ^ "Lego Dimensions Full Cast & Crew". ^ "Activision Blog: Crash Bandicoot N. Sane Trilogy Release Date Revealed". Wikimedia Commons has media related to Dwight Schultz. This page was last edited on 1 April 2019, at 16:29 (UTC).